Like we have face wash for face, body wash for body similarly we have Intimate wash for intimate area. The skin there is very delicate and need more care as compared to our body. We can't take risk of using harsh soaps there. Yes even the most expensive, delicate body wash are inappropriate, because body wash, soaps have lot of chemicals in it which makes it unsuitable for cleaning vaginal area. You have already read my review on VWash. 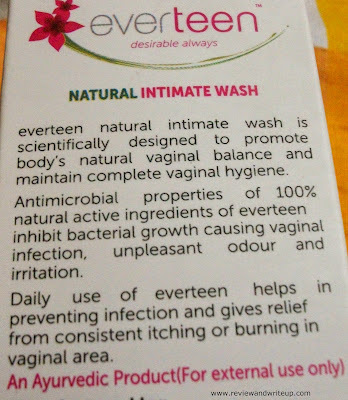 This time I wanted to try a new intimate wash so I got Everteen Natural Intimate Wash.
About the Product - This is an innovative product of Wet & Dry Group. The same group whose Barever Inhibitor I have already reviewed on Review and Write Up. I am really impressed with the brand as they use natural ingredients. For intimate wash also they have used natural ingredients. 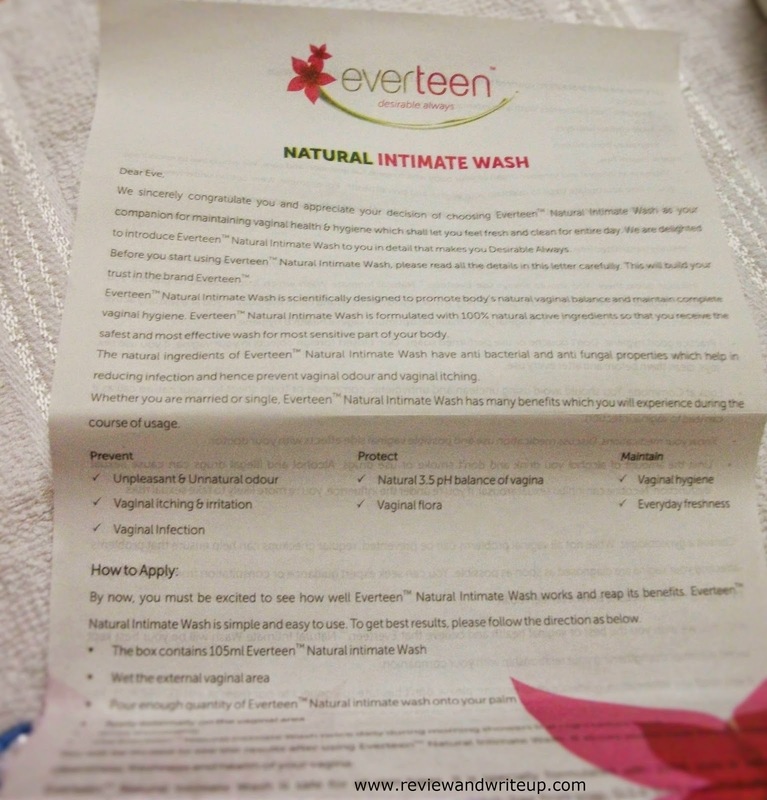 Packaging - Everteen Natural Intimate Wash comes in a very beautiful white and pink color cardboard box. Intimate wash is bottled in a cute see through plastic bottle with majenta-pink color flip open cap. The cap is really tight which ensures that the product won't spill. There is also a letter addressed to Eve (we). This is the most amazing thing I have ever seen in any product packaging. 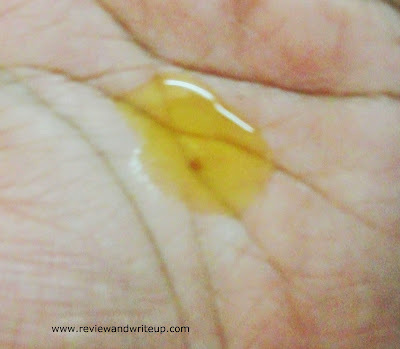 My Experience With the Product - Everteen Natural Intimate Wash has texture like that of gel which prevents it from slipping from palm when squeezed out from bottle. Because of its thick gel like consistency we can squeeze out intimate wash as per our will. It has mild fragrance. It lathers well and is very soft to use, alsowashes away easily. Not like soaps when we need more water to wash the foam. Its natural ingredients make sure that it prevents itchiness and irritation. Especially in summers using an intimate wash is an essence. If you are still using regular soaps, then please change it. Ladies are prone to vaginal infection easily. Good hygiene habbits can prevent it to great extent and among those one is using intimate wash. Everteen maintains PH balance, like after wash you don't feel dryness there. Recommendation is to use twice a day, in morning and night. It also prevents unpleasant odour. I will say you use it yourself and then feel the difference. This intimate wash is suitable for women of all age groups. 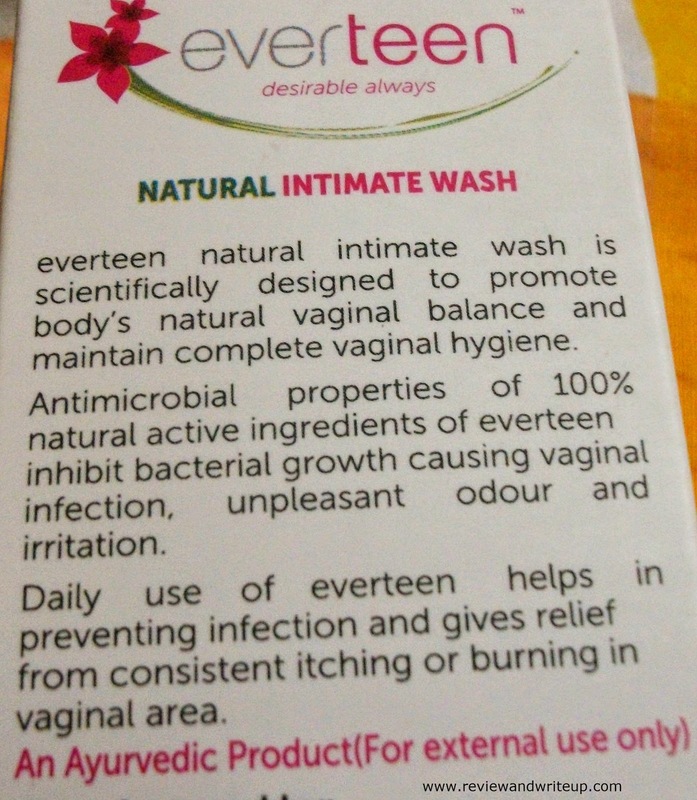 R&W Recommendation - Investing in Everteen Natural Intimate Wash is a wise decision.